Farms have long swapped water rights among themselves or with urban areas, but new research out last month reveals conservationists are now leveraging these tools for environmental purposes – such as leasing irrigation rights but using the water to replenish the watershed to restore habitat for endangered species and help secure clean water for communities. 20 January 2017 | The US state of Nebraska irrigates more farmland than any other state in the country, and much of that water comes from underground sources. In 2015, the Central Platte Natural Resources District launched the Central Platte Groundwater Exchange Program, making it possible for farmers with certified groundwater rights to either lease them out for a year or buy more if they’re interested in higher crop yields. Lyndon Vogt, the General Manager of the Central Platte Natural Resources District, said in an earlier article that the program could help drive efficiency as producers practicing flood irrigation may see opportunity in selling their water to farmers that use more efficient sprinkler irrigation. But farmers aren’t the only ones bidding: a conservation group called the Platte River Recovery Implementation Program hopes to leave the water in the watershed to help endangered species. They leased the right to a small amount – roughly 40 acre feet (enough to cover 40 acres of land in one foot of water) – to do so. 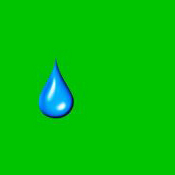 “The groundwater exchange program will allow farmers to increase their own individual profits finally un-tapping their full water wealth while also boosting overall agricultural productivity and protecting the river and all the birds and other wildlife that depend on it for their survival,” explained David McAdams, a Professor of Economics at Duke University involved in the exchange’s development, in an introductory video. “That’s what I call a win-win outcome,” he added. Nebraska’s Platte River region isn’t the only area to figure out water rights markets can deliver “bonuses” for the environment while benefitting farmers. According to Ecosystem Marketplace’s latest water report, Alliances for Green Infrastructure: State of Watershed Investment 2016, a variety of public and private sector actors spent $92.1 million in 2015 to secure water for the environment through mechanisms that buy or lease surface water rights (a mechanism known as instream buybacks) or groundwater rights in order to protect overdrawn river systems or aquifers globally. While not a milestone year, the report identifies something of a transition in the market to more flexible and cost-effective trading along with noteworthy points of progress. 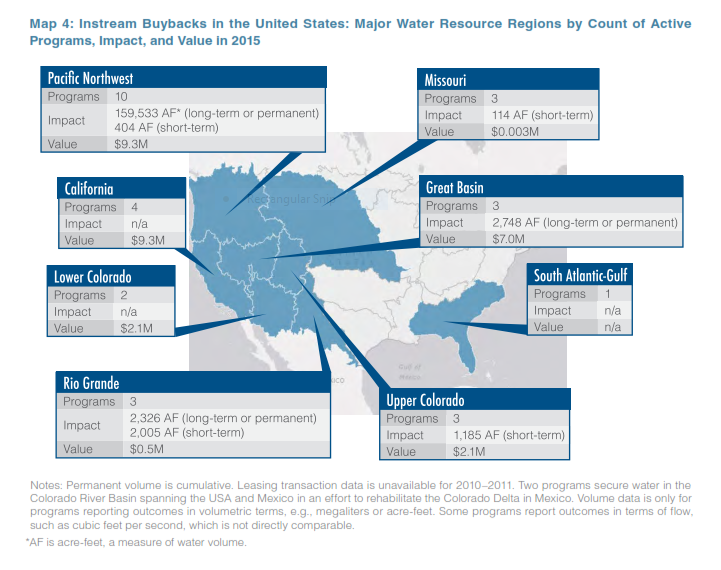 Instream buyback transactions increased in the US by almost 7 percent between 2012 – 2015. However, transactions declined globally due in large part to Australia’s decision to dial back its buyback program in the Murray-Darling Basin, a sprawling river system representing one third of the country’s agricultural production, 2 million of its people and 16 Ramsar-listed wetlands. Australia used to lead the world in the use of instream buybacks to revive rivers after droughts, but in 2012 a new government took office and prioritized infrastructure investments over the buyback strategy. More recently, authorities recommended to scale the Murray-Darling program down further after determining it drove job loss in rural communities by as much as 21 percent. As of 2015, the value of water buybacks in the US has surpassed those in Australia. As Australia dialed back in 2015, the report identifies a growing trend elsewhere, particularly in the US, in leasing versus buying water rights. The Central Platte Natural Resources District’s Groundwater Exchange Program, for instance, sells water rights just for one growing season while other programs have leases lasting as long as several years or as short as a few weeks. Farmers and other water rights holders are more willing to lease their rights than sell them, opening the door to flexible deals that provide water for the environment at critical times, such as spring spawning periods, said Genevieve Bennett, who authored the Ecosystem Marketplace report. “Leasing is also less expensive,” she added. “That’s another plus for conservation groups with limited resources. Groundwater mitigation programs in the western US, which essentially requires property owners seeking new or additional groundwater use to offset their impact by purchasing water rights, transacted some $1.2 million. These programs are generally driven by basin-wide caps or rules establishing minimum flow requirements for a river or stream. As administrator of the Groundwater Exchange Program in Nebraska, the Central Platte Natural Resources District ensures the trades don’t have a negative effect on streamflow. A few months ago, The Nature Conservancy announced a new investment model that essentially diverts water rights allocations back to nature. 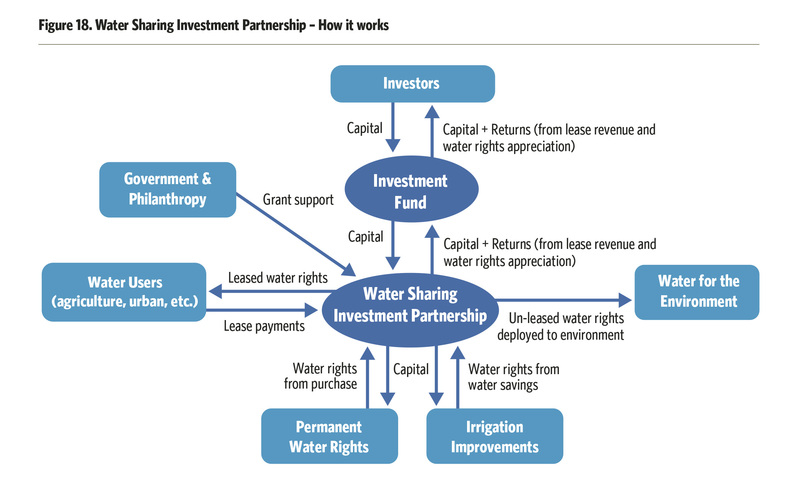 Called Water Sharing Investment Partnerships, they solicit investor capital to acquire a portfolio of water rights. Most of these rights are either leased or sold back on the market, giving investors a financial return and ensuring farmers and cities have access to enough water, though a portion of them are left in waterways to restore streamflow. A WSIP can acquire water rights by outright purchases, but also by collaborating with farmers to implement water saving measures in irrigation. When water carries a monetary value, those who have the rights to water supplies are motivated to conserve because they can sell the surplus for a profit, TNC explained last year in its report on WSIPs. Report authors count 37 water-scarce nations with allocation systems based on distributing water rights, which with the right policy drivers, could harness the powers of impact investing for conservation and water efficiency. TNC launched the first WSIP in Australia. Essentially, this WSIP consists of two parts, the Murray-Darling Balanced Water Fund and the Environmental Water Trust. Investments from wealthy well-known Australian families, corporates and other entities helped put $20 million into the Murray-Darling Balanced Water Fund. Much of that is funneled back into the agricultural community, though a portion of the water rights allocations is donated to the Environmental Water Trust to be used to restore some of the basin’s water-starved wetlands. The trust targets wetlands with high ecological and indigenous value, according to TNC’s report. Within the next four years, the Murray-Darling Basin Balanced Water Fund aims to scale up funding to $76 million. Meanwhile, a consortium of conservation groups in Mexico and the US launched a massive effort in the last few years to restore the Colorado River Delta and it includes water rights purchases. The Colorado River Delta Water Trust, a coalition comprised of the Environmental Defense Fund, Pronatura Noroeste and the Sonoran Institute has been purchasing water rights on the open market. According to the Sonoran Institute webpage on the Colorado River Delta Program, the Trust is on track to meet its water delivery goals. Working through water markets lets the coalition act quickly, Osvel Hinojosa, Pronatura Noroeste’s Water and Wetlands Program Director, explained in an earlier Ecosystem Marketplace article. “We saw great potential to reach an allocation of up to 60 million cubic meters per year, and particularly water with very good quality,” he said. The Trust purchases the buybacks in the Mexicali Valley and is the first organization to purchase water exclusively for nature in Mexico. The water buybacks in the Colorado River Delta are also the first time such a mechanism has been used across national boundaries. As Alliances for Green Infrastructure identifies a growing interest in using water rights trading to benefit nature, researchers note that these trades don’t have to come at the expense of economic growth. Since buyers and sellers will only trade where there is economic opportunity in doing so, the mechanism allows agricultural economies to grow while protecting freshwater ecosystems, Bennett writes.